A Nigerian company has put together all it takes to launch in two weeks, a new innovation that will allow cooking gas consumers buy as little as they want via Mobile Money – a system that would allow Rwanda to reduce pressure on forests, the main source of cooking energy. The technology was introduced by one Oluwatobi Oyinlola, the founder of SkyRockets – an IT company. Through a meter installed on a gas cylinder, the technology allows gas consumer to monitor information about the quantity of gas used and the remaining gas. With this in mind, the consumer requests, by paying through Mobile Money, the quantity of gas to use during a certain period of time, also called “Pay As You Cook”. “We are planning to launch it very soon at the end of this month,” Oyinlola told KT Press via e-mail on Wednesday. “We are going to start by Rwf300 per day, which you can pay on Mobile Money and have access to cook in the morning and evening. That’s very cheap for a person who needs gas to cook and doesn’t have to return to charcoal,” Oyinlola. In other words, the company will bring you filled up gas cylinder free of charge, and you will pay through Mobile Money to cook a meal, two or three and so on. This would remove the hustle of having to pay Rwf10, 000 to buy 10 kilograms of gas at once. “We will have a smart valve on top of the cylinder which measures how much gas you are dispensing and calculate that in amount of money which you can pay by mobile money…the focus will be on those who cannot afford cylinders,” Oyinlola said in an interview with CNBC Africa on Monday. As soon as the gas is finished, the supplier will come and replace it with a filled gas cylinder. Oyinlola explained that the innovation will come with partnering with local suppliers who will supply liquefied petroleum gas (LPG) and equipment but the technology will be provided by the founder of SkyRockets. “We are running over 100 pilots sample in Kigali in one location. In few more weeks people can walk to any nearby gas suppliers in the area to subscribe for it,” Oyinlola said. SkyRockets was among the best 10 ICT solutions for Smart Cities rewarded in 2018 by government of Rwanda as a way of encouraging innovation among the youths. At least 65% of Rwandans still use charcoal despite the increase in consumption of liquid gas products and cooking equipment on the market which remains costly. Gas in cylinder is supplied door to door containing between six to 20 and 50 kilos, while A sack of charcoal that can last for two weeks costs Rwf12000 at different stock points. 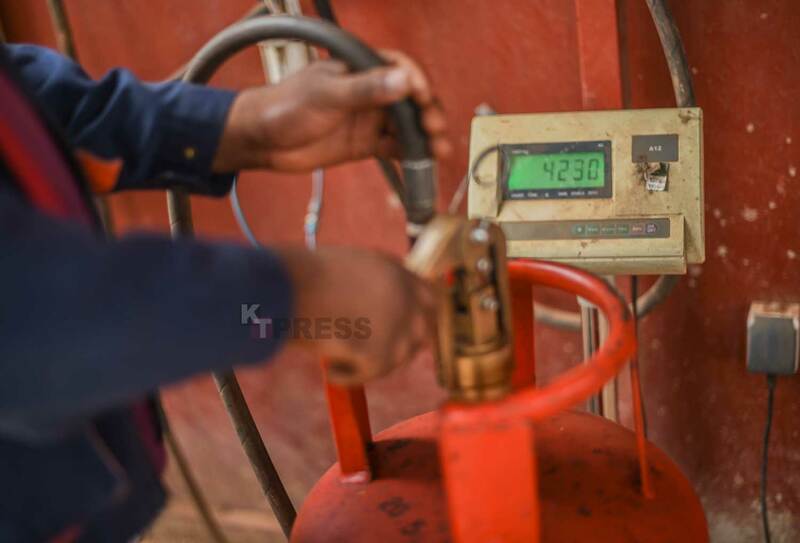 Currently, a gas cylinder buys close Rwf65, 000 and a kilogram of gas on the retail market around the capital Kigali is between Rwf1000 ($1.14) and Rwf1400 ($1.61) depending on the location. For persons who have gas cylinders but cannot afford these prices every month, Oyinlola says that the pay as you cook technology will ensure each pocket is covered for those who have no money to refill cylinders. This innovation is simply incredible to reach our goal to eradicate tree cutting on a massive level for burning charcoal and we are looking forward for it.